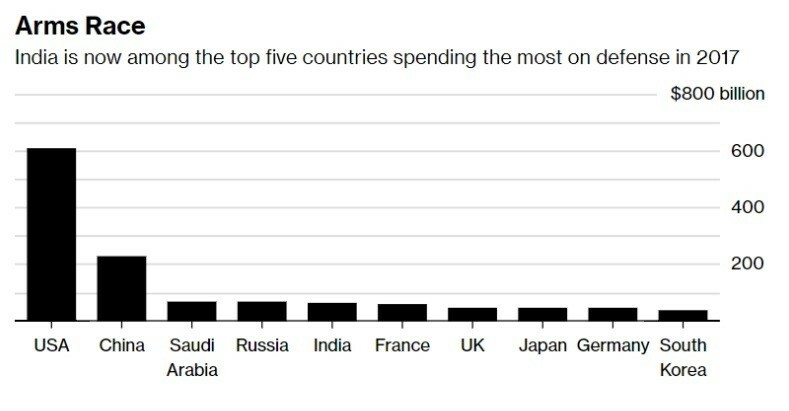 ndia has joined the United States and China as one of the world’s five biggest military spenders this year, as the balance of military spending shifts further towards Asia. India’s defence spending rose by 5.5% to $63.9 billion in 2017, as the South Asian country leapfrogged France in the expenditure ranking. Overall global military spending rose by 1.1% to $1,739 billion in 2017, according to the figures collated by the Stockholm International Peace Research Institute. That is the highest level since the end of the Cold War, after the global total remained more or less stable between 2012 and 2016. Meanwhile, the regions of the world that are wielding the most might are changing. “At the global level, the weight of military spending is clearly shifting away from the Euro–Atlantic region,” says Dr Nan Tian, researcher with the SIPRI Arms and Military Expenditure programme. The reasons for India’s substantial rise in defence spending are many. Firstly, there are increased geopolitical tensions within Asia, including the need for self-defence against any possible attack from North Korea. Countries also feel some pressure to keep pace with China’s rapidly growing military investments. Beijing’s share of the global military spend rose to 13% in 2017, a far bigger proportion than its global share of 5.8% in 2008. “Tensions between China and many of its neighbours continue to drive the growth in military spending in Asia,” says Siemon Wezeman, senior researcher with the SIPRI AMEX programme. Secondly, India is dealing with the enormous cost of salaries and pensions of its 1.4 million serving military personnel and 2 million plus veterans. The burden of these salaries on India’s military strength was highlighted recently by Lt. Gen Sarath Chand at a parliamentary committee in March. Just 14% of the overall defence budget goes toward military modernization compared to 63% for salaries, he told politicians. Despite the global increase in defence budgets, Russia has experienced a sharp decline in its military spending. Russia is consistently in the top five military spenders, and has steadily increased its military spending between 2008 and 2016 in a concerted effort to update its military systems. Last year, however, the country’s spending fell by 20% to $66.3 billion, the first fall since 1998. “Military modernization remains a priority in Russia, but the military budget has been restricted by economic problems that the country has experienced since 2014,” explains Wezeman. The Russian economy has been hit by the impact of falling oil prices together with Western sanctions. But it had avoided cutting its defence budget until last year. Such a sharp budget reduction is likely to have a significant impact on procurement and operations, including those in Syria. Despite all the movements elsewhere in the top 5, the US defence budget remains largely unchanged, and its position as the world’s biggest military spending remains unchallenged. 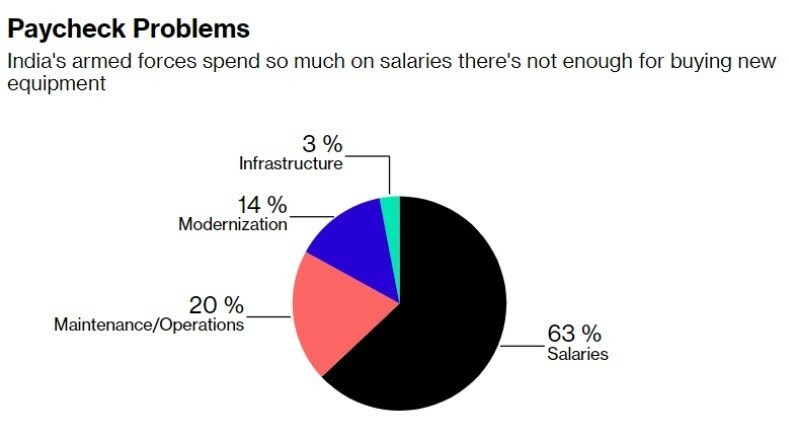 It accounts for 35% of global expenditures, more than the next seven highest-spending countries combined. Pakistan deploys Chinese air defence system: Where does India stand?